The most important purpose of Yoga is to bring about a deep transformation of the individual--an awakening of intelligence that is free of dependencies and romantic beliefs and ready to meet the accelerating challenges of the 21st century. White Lotus Foundation holds Yoga teacher training courses four times per year in Santa Barbara, CA at our beautiful retreat center in the mountains. Students attend from around the country to receive their yoga certification. 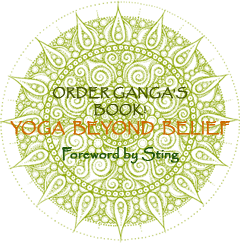 For in-depth information on our Yoga Certification Program, click Yoga Certification. Our courses are renowned around the world for their comprehensive content, individual attention to each student, and for the wonderful transformational experience of studying with yoga pioneers and best selling authors, Ganga White and Tracey Rich. White Lotus Foundation offered the first yoga teacher training and certification in America in 1968. Web design by Tracey Rich. Web Development by M4 Interactive.